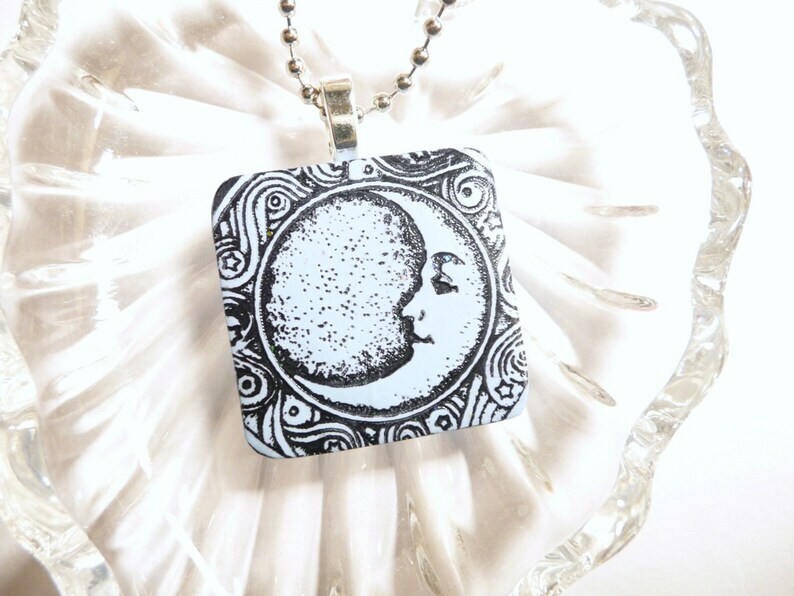 This Blue Moon Pendant / Necklace features a stamped design of a crescent moon with face, stars and swirls. Handmade of light blue polymer clay, stamped with black ink and sealed with glossy acrylic varnish with tiny sparkles. Measures about 1 1/4 inch wide x 1 1/4 inch tall (approximately 3.2 x 3.2 cm). Finished with a large aanraku silver-plated bail. Add a pretty, shiny 18 inch silver plated ball chain, 2.4 mm in diameter, nickel and lead free, with a lobster clasp.